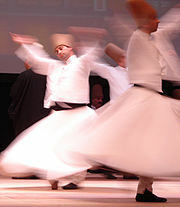 A dervish or darvesh is a type of Sufi. It is someone living a Sufi Muslim ascetic way or "Tariqah". They are poor, and live simply. In this respect, dervishes are most similar to mendicant friars in Christianity, or Hindu/Buddhist/Jain sadhus. The whirling dance that is associated with dervishes is best known in the West by the performances of the Mevlevi order in Turkey. It is part of a ceremony known as the Sema. It is also done by other orders. The Sema is only one of many Sufi ceremonies performed to try to reach religious ecstasy (majdhb, fana). The name Mevlevi comes from the Persian poet Rumi, who was a dervish himself. This practice, though not intended as entertainment, has become a tourist attraction in Turkey. ↑ "Darvesh - Dictionary of Islam". Answering-islam.org. Retrieved 2012-02-19. ↑ "Online Etymology Dictionary". Etymonline.com. Retrieved 2012-02-19. Somali: Daraawiish, Arabic: درويش‎, Darwīš. ↑ Afroukhteh, Youness (2003) . Memories of nine years in 'Akká. Oxford: George Ronald. ISBN 0-85398-477-8. ↑ Koentges, Chris. "13 things the whirling dervishes can teach you about spinning until you're dizzy enough to puke". The Very Ethnic Project. This page was last changed on 10 May 2018, at 12:17.